The organization was originally founded in 1957 by a group of concerned parents who were seeking support for their children with special needs, and was originally part of the Quinte Association for Retarded Children in Belleville. In 1959 a group of parents from the Trenton and Brighton area decided to set up their own agency called the Trenton-Brighton and District Association for Mentally Retarded Children. The group received their charter from the Ontario Association for Retarded Children (now known as Community Living Ontario) on November 14, 1959. The agency was incorporated on August 4, 1961. The first program to be operated by the Association was the Stepping Stones Nursery School which was established in 1959. For a time classes were held at CFB Trenton and then moved to St. Peter’s School and then to the North Trenton Elementary School. In 1961, on land donated by Harry Lafferty, diligent volunteers built a one story school house at 52 Lafferty Road. The Stepping Stones program operated there until 1988 when it was closed and replaced with the new Stepping Stones Integrated Preschool Services at 25 Ontario Street in Trenton. In 1997 a decision was made by the Ministry to amalgamate the integrated nursery program with 4 other existing programs in the area to become a stand alone agency called Family Space. Between 1988 and 1994 the building was used as a flea market to raise needed resources to operate the different programs. In 1994 the site of the Stepping Stones School became the site for the June Hodgson Resource Centre which provided life skills training to individuals with an intellectual disability. In 2004 the agency’s head office, the Supported Independent Living Program and the Foundations Program (TAY) moved to this location while the Resource Centre moved to our location at 11 Canal Street. In 2007 the SIL and TAY programs moved back to 11 Canal Street to keep all services in the same location. In 2013 the main office moved to 11 Canal Street and PawsActive Doggie Daycare & Grooming moved to 52 Lafferty Road. This move allowed for better access for management and staff and gave the dogs a better environment to enjoy. In 1968 the Association built the sheltered workshop, ARC Industries (Adult Rehabilitation Centre). Originally located on Guelph Street in Trenton this program moved to 11 Canal Street location in 1975. In 2002 the building at 11 Canal Street was renamed the Joan Scott Developmental Centre to honour one of the Association’s most dedicated supporters. At this time the Joan Scott Developmental Centre was home to ARC Industries and the Day Options Drop in Centre, now known as the Compass Program. In 2004 due to economic decline the ARC Industries Workshop was closed and the agency concentrated on delivering education and skills training. The PawsActive Doggie Daycare was opened in 2008 at 11 Canal Street as a training program. In 2010 this business expanded to include dog grooming services and in 2016 to offer cat grooming services. The business moved to 52 Lafferty Road in 2013. Due to the lack of interest from supported individuals the Paws Active Doggie daycare was closed in May of 2017. In 1977 the agency opened their first residential program on Marmora Street in Trenton. In 1991, a second group home was opened at 59 Bentinck Street. The building on Marmora Street was sold in 1997 and the Lafferty Road group home was opened. In 1998 the agency opened the Fraserglen home. It was in the 1980’s that the agency opened the Supported Independent Living Program which assists individuals with an intellectual disability to participate in the community while living in their own apartments or homes within the community. Since 1995 an integral component of this program has been the apartments at 32 Flindall Street. 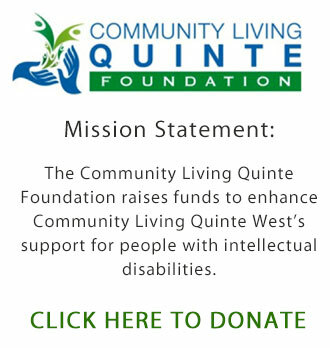 Located in an apartment complex in Trenton, and through a head lease agreement with the local non-profit housing authorities, Community Living Quinte West provides support to eight individuals in their own apartments on Flindall Street. This is in addition to another eight individuals living in their own apartments throughout Trenton. This number continues to grow. In October of 1991 CLQW opened its first avocational day program, Directions. The program was developed to offer stimulating activities to the ladies from the new Bentinck St. Group Home and to eight ladies from Colbourne who no longer wanted to work at ARC. Directions morphed into the Day Options program to meet the needs of others who were ready to retire. In 1994 this program moved out to the June Hodgson Resource Centre and computer programs were introduced to the life skills curriculum. The Day Options Program moved back to 11 Canal Street in 2004 so that all programming was in the same area. In 2008 day programming changed to become more structured and educational based. This new program was called Compass and offered educational programs in science, environment, life skills, and the arts. Today Compass is undergoing a remodelling to meet the desires of the participants. The teaching of life skills will remain a part of the program but more recreational activities will be introduced. In the spring of 2015 the Family Engagement Network was organized to bring families together to discuss topics of mutual interest such as education, housing, and employment. Any parent or care giver is welcome to join the group. Over the years CLQW has operated a number of programs for individuals with an intellectual disability in Trenton and the surrounding area. Today Community Living Quinte West operates three residential programs, a Supported Independent Living Program, a Transitional Aged Youth Program, and the Compass Program. We provide supports and services to over 55 individuals and families, and are active members of the Hastings & Prince Edward Developmental Services Agencies FOCUS GROUP and the Pressures and Priorities Committee. We also have membership on the DSW Advisory Committee at Loyalist College. The agency currently employs over 40 full and part- time staff. CLQW is also a founding member of the HELMS program. Health Energy Learning Motivation thru Sports is a program designed to offer adults with intellectual disabilities the opportunity to experience community sports in an inclusive manner. The agency has also had a number of name changes over the years that help to reduce the stigma associated with labeling people, and which better reflect the positive changes that have taken place in the developmental services sector: Trenton-Brighton and District Association for Mentally Retarded Children, Trenton-Brighton and District Association for the Mentally Retarded, Trenton & District Association for Community Living, Community Living Trenton & District. Today the agency is known as Community Living Quinte West, a name that is meant to stress our ties to the community and to reinforce our main objectives which celebrate community participation rather than segregation. Community Living Quinte West is a membership based organization that is governed by a dynamic volunteer Board of Directors. The agency is a registered charity and membership is open to anyone who supports our mission and goals. We receive our funding from the Ministry of Community and Social Services, as well as from community fund raising endeavors and donations.